We offer the largest selection, lowest prices, and the most dependable brands in our bargain bin. 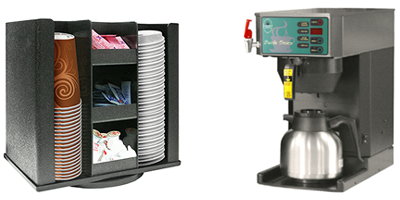 Choose from coffee makers, coffee maker accessories, dispensers and organizers, espresso accessories, instant beverages, thermal airpots, water coolers and water filters. We have clearance items, closeouts, refurbished equipment, overstock and product returns that will save you money. Our highly knowledgeable sales associates are here to assist you with any questions you may have before, during and after the sale. Grindmaster Liquid Box Fitting CLEARANCE! ONLY 4 LEFT. QCD liquid box fitting. Complete fitting assembly. Sold As: 4 Pack. Compatible Brewers Grindmaster LCD-2 coffee dispensers.